When all was said and done after my Graves’ disease rollercoaster, I was 35 pounds overweight, and nearly 40 from where I was before I got sick. I finally felt “not sick,” but I felt terrible about myself. My eyes were back to normal but I was so overweight that I still didn’t look like me. It’s been a very slow process, mostly because I’ve gotten frustrated and thus gave up, but I mean it this time. I’m 30 now, and my health is likely downhill from here, so no more excuses. They say that when you no longer have a thyroid, it becomes VERY hard to lose weight, especially belly fat. I’m on the perfect dose of synthetic thyroid hormone replacement (called Synthroid), and my levels are right where they should be, but it’s not the same. Doctors, nurses and other patients have told me this, yet doctors still want your BMI where it should be. I won’t say what the scale says, but my BMI is a 29.1 right now. Yes, I am overweight but the fact that for several years I was categorized as obese really bothered me. The first time I actually saw it in writing was in my gastroenterologist’s notes when I moved back from Florida and requested my medical records from all my specialists. It said something like, “27-year-old, obese white female.” WHOA. I cried and he said, “Well, you are.” However, my primary care physicians and I have always agreed that – given my frame and muscular build – my ideal weight is on the very high end of normal, or the very low end of overweight, give or take a few pounds. I’m happy to report that as of this week, I’ve reached a new milestone and am in a whole new bracket. I’m more than 16 pounds lighter than I was when this whole “getting the old me back” journey started, and 16 pounds lighter than the number I refuse to see ever again. I’m almost halfway to my goal weight! I’ve started the Jillian Michaels Body Revolution program at least five times. The farthest I got was right around two years ago when I made it to the 7th week and then went to Dallas for a few days and lost all progress (OK, I gave up). It’s a 12-week, 6-phase program (she calls it a 3-phase program but I disagree). It’s supposed to be 6 days a week – strength 1, strength 2, cardio, repeat all 3, take a rest day, start over. You do that for two weeks, then move onto strength 3, strength 4, but still do the same cardio workout. It isn’t until week 5 that you get a new routine routine, and for me, that was a dealbreaker. The cardio is SO boring. I mean, it’s tough, but you repeat the same 10 cardio bursts (60 seconds each) three times, so doing that 8 times in one month is really freaking boring. I know I’ve lost you by now, so just take my word for it that the cardio is boring. So, I decided to use the strength workouts to supplement my running. On Jillian’s cardio runs, I skip her workout and run instead. People spend around $100 on the DVDs, but they’re now available on YouTube. And thanks to my dear brother bear, who gave me a Roku for Christmas, I can play the workouts right from my TV in my bedroom (sorry downstairs neighbors. Actually, not really. Your dog’s howling and TV blaring doesn’t even come close to me working out for 30 minutes after work or in the middle of the day on a weekend). When I first started this program, I couldn’t figure out how many calories I was burning. I tried Googling it, I tried using all sorts of calorie databases, but then I learned that it varies greatly from person-to-person. I clearly had no idea how calorie burn really worked. So I kept doing research and everything told me I needed a heart rate monitor. Again, didn’t know much because I thought I could just buy one of those little watches. Well, you can, but you also need the chest strap that actually tracks your heart rate for the entire workout, and calculates the calories burned. Pretty complex, so you can imagine why these things can run $100-$200. However, I wasn’t willing to spend that kind of money so I found a Pyle Sports heart rate monitor that seemed to fill the bill – and my budget. It’s ugly and huge and clunky, but it does what I need it to do. The heart rate is always spot on (I became very good at manually measuring my own heart rate when I had tachycardia for four years), so I trust it. I average around 250 calories for a 36-ish minuted workout, and that includes warming up and cooling down. I imagine this will get higher as the workouts get more intense, or maybe not because I’ll be in better shape. We’ll see. Well, Monday was supposed to be a run day and Tuesday my day off. However, we got 26 inches of snow Monday night into very late Tuesday, and most sidewalks still aren’t cleared and roads are down to one lane with HUGE snowbanks, so I decided running wasn’t a good idea. 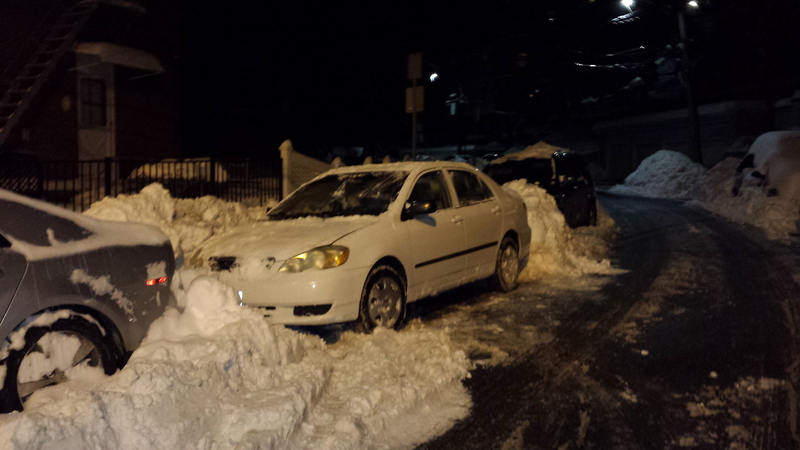 Instead, I took Monday off and my workout on Tuesday was digging out my car. It was a very light, fluffy snow so I only burned 351 calories in the hour it took me to dig out, but you’ll see in the last photo from this morning that I’m plowed in again, so I’ll have to spend some more time shoveling after work in addition to Workout 1. 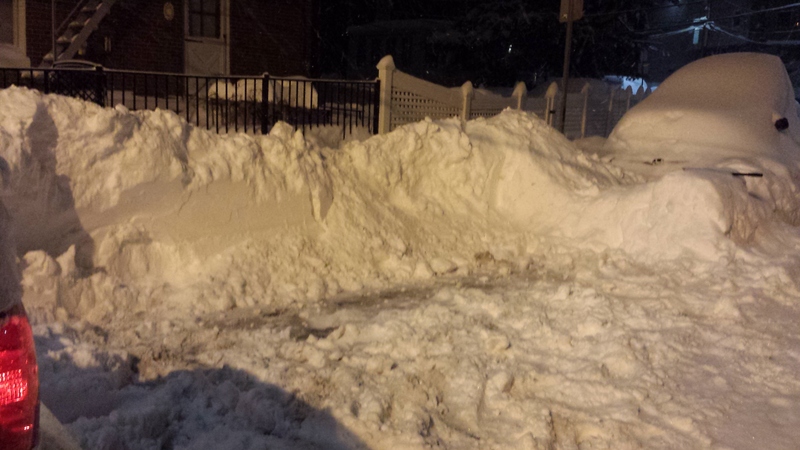 6 a.m. Wednesday – not cool, plows! I finally coughed up my $75 registration fee to run with the Dana-Farber team for the B.A.A. 5K again in 2015. The race is on April 18, which is three months away. Last year I only had a month to fundraise, so I’m hoping to surpass my $1,000 fundraising goal. The link is https://rundanafarber.org/2015/kellyp. Please give, if you can!